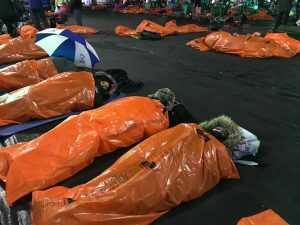 A team of Hillcrest Group staff took on Social Bite’s Sleep in the Park challenge on Saturday in a bid to help raise awareness and money to contribute towards eradicating homelessness in Scotland. 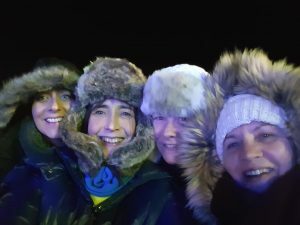 The team, made up of Clare McNally, Joy Dunlop, Yvonne McKinlay and Sharon Murdoch, braved the cold at Dundee’s sleep out event and together raised £1559. Hillcrest partnered up with Thorntons Solicitors and overall the two companies accumulated an impressive £14,529 for Social Bite’s Housing First scheme. The innovative project aims to help homeless people across five cities in Scotland to be given secure long-term tenancies as well as putting structured support plans in place. 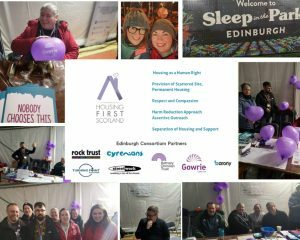 Meanwhile at the sleep out event in Edinburgh Gowrie Care, part of Social Bite’s Housing First Edinburgh initiative, joined other representatives from the consortium to host information stalls. 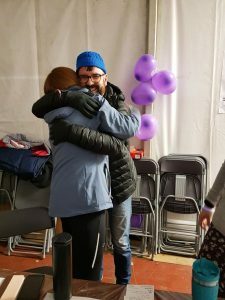 The stalls aimed to raise awareness about the services each charitable organisation offers to help tackle homelessness, as well as what the consortium delivers and the benefits of partnership working. Gowrie staff Graeme Brown, Susan Dunn and Ross McKay manned the stall and handed out information booklets about Gowrie’s services in Edinburgh. 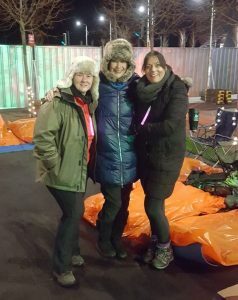 The trio also offered free hugs to passers-by which proved to be a popular attraction on the night! To find out more about Sleep in the Park click here.